With all the rain last week you may have been sleeping and missed out on some pretty great games. Here’s our Weekly Sports Update. Women’s Volleyball hosted Stevenson University on Tuesday night in a MAC Commonwealth matchup. Kate Preudhomme, Lanae Hunsberger, and Mary Underman led the way each recording at least 10 kills. The Falcons lost the first two sets of the game but made a push in the third set winning 25-20. Unfortunately, the Mustangs controlled the fourth set winning 25-21, as the Falcons lost the match 3-1. Over the weekend, the Falcons held the Messiah Invitational. In the first game against New Rochelle, Messiah won three straight sets 25-15, 25-14, and 25-21. Game two proved to be a little more difficult as Messiah defeated York College 25-13 in the first set but lost the next three matches 25-23, 25-20 and 28-26. Underman led the team with 14 kills and Amanda Dahlman led with 18 digs. The Falcons came close in set three but lost the match 3-2. Dahlman recorded 37 digs over the give sets and Braedyn Gallagher and Heston Cowoski added more than 10 digs each as well. Field Hockey defeated the Juniata Eagles 2-0 on Wednesday. After a scoreless first half, senior forward Kezia Loht scored her first goal of the season. Then, at the end of regulation junior forward Taylor Wiederrecht scored off an untimed corner sealing the game for the Falcons. 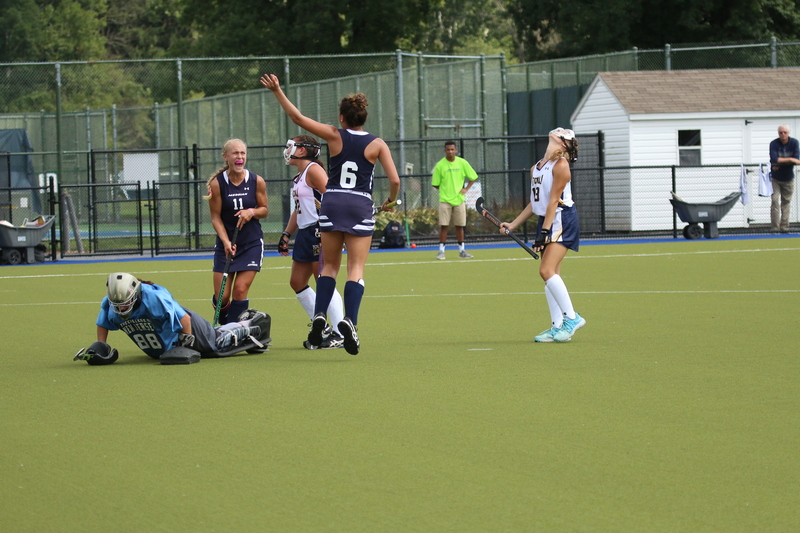 Field Hockey- Hannah Palm, #6, celebrates a goal. On Saturday, the Falcons played The College of New Jersey. Hannah Palm and Jennie Young each scored two goals as the team won 4-2. Their record is now 5-0. Women’s Soccer shut out DeSales University earlier this week with a score of 7-0 after posting 29 shots. Freshman McKenzie Swartley, junior Brooke Firestone, and senior Julia Kyne all contributed 2 goals each. In their first away game of the season, Messiah beat Carnegie Mellon University 4-1 after three first-half goals from Sunny Gelnovatch, Brooke Firestone and Emily Lockwood. Men’s Soccer beat Dickinson College Wednesday night. Nick West scored 3 goals in the win. David Alejos and Luke Brautigam each added a goal as Messiah went on to win 5-2. Nick West scored his tenth goal of the season Saturday night as Messiah defeated Eastern Mennonite University 2-0. David Alejos added another goal in the win as the Falcons are now 5-0-1. Women’s Cross Country took part in the Bill Fritz Invitational on Saturday. Leigha Southall finished in 2nd place and led Messiah runners with a time of 23:18.43. Men’s Cross Country also participated in the Bill Fritz Invitational on Saturday placing 5th out of 23 teams. Senior Zachary Lofties finished with a 26:45.03 on the 8k course and teammate Benjamin Schott finished soon after with a time of 26:45.47. Women’s Tennis lost to the Gettysburg Bullets 6-3 Saturday afternoon. Men’s Tennis also lost to Gettysburg 9-0 over the weekend in their first match of the season. Women’s Soccer @ Elizabethtown College 5:30 p.m.
Field Hockey vs. Catholic University of America 7:00 p.m.
Men’s Soccer vs. York College 7:00 p.m.
Women’s Volleyball @ Arcadia University 7:30 p.m.
Men’s Tennis vs. University of Scranton 9:30 a.m.
Field Hockey @ Widener University 1:00 p.m.
Men’s Soccer @ Misericordia University 3:30 p.m.
Women’s Soccer vs.Misericordia University 7:00 p.m.